This Spanish-language collection of songs for prayer and adoration connects and inspires believers of all ages. 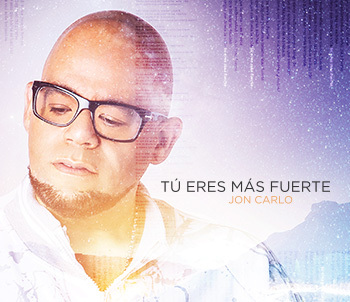 This the CD for Jon Carlo's newest collection Tú Eres Más Fuerte. Find all the songs included in Tú Eres Más Fuerte in this convenient digital playlist. Through powerful lyrics, Jon Carlo shares his story of courage and strength. He opens his heart to tell us how he managed to overcome difficulties through faith. These modern arrangements will inspire listeners of all ages, like the opening track “La Respuesta,” where Jon Carlo describes feelings of doubt toward God’s presence when encountering suffering in the world, he further expresses that the solution is within us as we work to be God’s instruments, sharing his love and word with actions. On the other hand, “Ella” is a Marian tune with playful language that invites teenagers and adults to follow the Virgin Mary in her footsteps. Softer songs include “Quiero Volver,” inspired by the parable of the Prodigal Son and the desire to return home, and “Envíame a Mí,” a discipleship song about going forth, captures the desire of spreading God’s word to places without love or peace. While developing this collection, Jon Carlo worked with musicians, singers and composers from North and South America, combining versatile styles and influences, as is the case with “Confianza,” a song trust, “No Te Vayas,” featuring Argentinian singer, Athenas, and “Yo Te Adoro,” a song about the complete surrender and devotion to God. Tú Eres Más Fuerte is a reminder that no matter what we're going through, God is with us through it all. With faith, there is no fear.